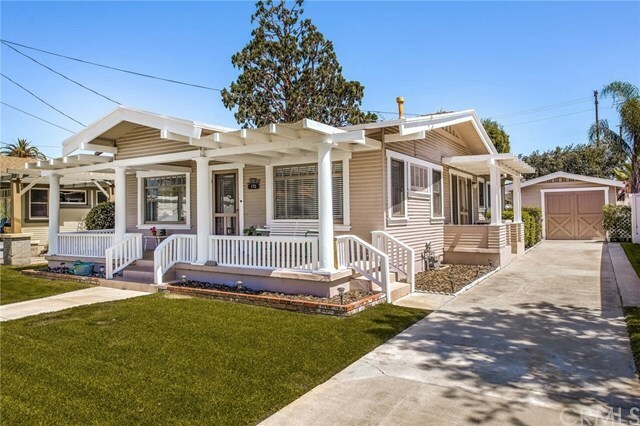 RARE OPPORTUNITY TO OWN A CLASSIC 1924 BUNGALOW on one of the most sought after streets in the OLD TOWNE NATIONAL REGISTER HISTORIC DISTRICT! This beautifully kept, traditional home has a full width front porch to watch sunsets from, and has maintained its best original features: HARDWOOD FLOORING, ORIGINAL LIGHTING FIXTURES and built-ins, which include the original FORMAL DINING ROOM BUFFET and IRONING BOARD, among others! In addition to 2 spacious bedrooms, thereâs a good sized separate den. An attractive kitchen has vintage style ceramic tile counters and an eating area. The main bathroom boasts a CLAW FOOT TUB and PEDESTAL SINK, and thereâs also a MASTER BATH with a beautiful stall shower. Additionally, this home has CENTRAL AIR CONDITIONING, a 3 year old roof, earthquake retrofitting and all new plumbing and wiring! Thereâs a separate storage room/office behind the oversized 1 car garage. The large rear yard boasts a covered patio and approximately 11 fruit trees, most of which are bearing. Relish the convenient walking distance to just about everything, and the pride that comes with calling Old Towne Orange home! Directions: From the Plaza, to east on Chapman Avenue and just before the third signal (Cambridge Street), turn right onto N. Pine Street.